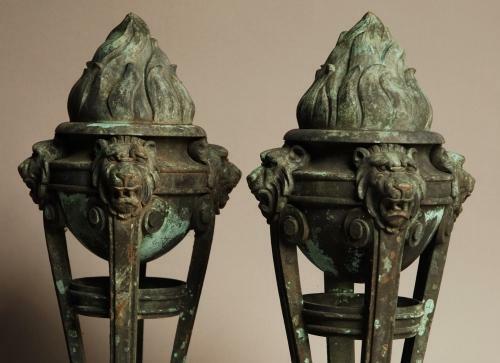 A very decorative pair of bronze late 19th century Italian flambeaux with green patination. These flambeaux are of fine quality with a weathered appearance due to being outside a Town Hall for many years in Italy. They each stand on four supports with lion masks and terminate with extending paw feet. These pieces have screw in bases which would have been originally concreted to secure them - these can either remain or can be easily removed.